Lynda has two books in development for publication in late 2016 and early 2017. One will be a book of essays and stories; one will be a book of new and selected poems. Lynda lives with her husband Bob in the Village of Wurtemburg in Western Pennsylvania. They have been married for 55 years. 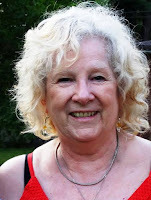 Lynda spends her days writing, making fiber art, and walking her 2 dogs in the woods along the Connoquenessing Creek. Klink or a curve for my envious eyes. Myriad of enlarged verbal sounds. Venture beyond the elemental lexicon. Yank these empty letters from the English alphabet! “Z”will represent every elemental consonant in the Garden of Eden. in a matrix of the harmonic rainbow.